The teaching materials for this learning experience on “Marriage and Family” are divided into three parts. In part 2, students will study paragraphs 8.1 and 8.4 of this doctrinal topic in the Doctrinal Mastery Core Document. They will learn about the covenant of celestial marriage, and they will study the doctrinal mastery scripture passage found in Doctrine and Covenants 131:1–4. Part 2 also includes a practice exercise that will help students apply what they learned. Note: You could teach the segments and practice exercise of this lesson in a single class session or over the course of several class sessions. If you choose to teach the segments and practice exercise over the course of several class sessions, you may need to briefly review with students what they learned in previous segments before you teach a new segment. Note: This segment discusses the importance of eternal marriage in God’s plan. Because some students come from families that have not yet experienced this ideal, share with the class the following statement from President Howard W. Hunter (1907–1995) before teaching this segment: “No blessing, including that of eternal marriage and an eternal family, will be denied to any worthy individual. While it may take somewhat longer—perhaps even beyond this mortal life—for some to achieve this blessing, it will not be denied” (“The Church Is for All People,” Ensign, June 1989, 76). 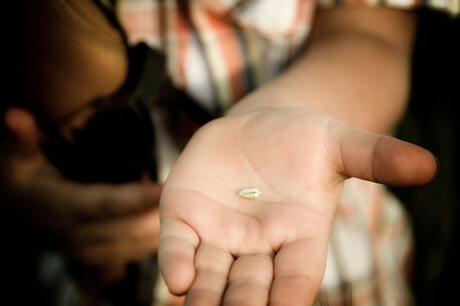 Bring a seed to class, or display a picture of a seed for the students to see. Tell the students what kind of seed it is. What does this seed have the potential to become? Refer students to the second sentence of paragraph 8.1 in the Doctrinal Mastery Core Document. Invite a student to read this sentence aloud. Ask the class to follow along, looking for what must take place in order for us to fulfill our eternal potential. Invite students to turn to Doctrine and Covenants 131:1–4. Explain that this doctrinal mastery passage helps teach the key statement of doctrine that men and women must enter into and keep the covenant of celestial marriage in order to fulfill their divine, eternal potential. Invite students to consider marking this passage in their scriptures in a distinctive way so they will be able to locate it easily. To help students understand the context of this passage, explain that Doctrine and Covenants 131 includes teachings the Prophet Joseph Smith gave on May 16, 1843, to a husband and wife who had been sealed for eternity. Invite a student to read Doctrine and Covenants 131:1–4 aloud. Ask the class to follow along, looking for what the Prophet Joseph Smith taught about eternal marriage and the celestial kingdom. You may need to explain that the phrase “the new and everlasting covenant of marriage” (D&C 131:2) refers to the covenant of eternal marriage, which is now performed only in temples. This covenant is described as “new” because it was revealed once again through the Prophet Joseph Smith in the dispensation of the fulness of times. It is called “everlasting” because it will endure through eternity for those who enter into it and are faithful to its terms and conditions. What are some things that might prevent people from choosing to get married in the temple? “In the temple we receive the highest ordinance available to men and women, the sealing of husbands and wives together for eternity. We hope our young people will settle for nothing less than a temple marriage. 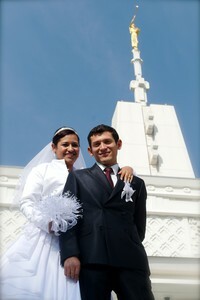 “Just as baptism is a commandment of the Lord, so is temple marriage. … It is part of our destiny. We cannot fulfill our ultimate aims without it. Do not be satisfied with anything less” ( Teachings of Presidents of the Church: Howard W. Hunter , 210). What are some of the most important reasons why we should not be satisfied with anything less than a temple marriage? What are some things you can do now to ensure that you settle for nothing less than a temple marriage in the future? Testify of the importance of a temple marriage. Encourage students to commit now to be worthily sealed to their spouse in the temple. Provide each member of the class with the accompanying handout. Invite a student to read aloud the scenario in the first two paragraphs of the handout. Group 1: Look for ways that President Eyring invited us to act in faith. Group 2: Look for ways that President Eyring examined this issue with an eternal perspective. Group 3: Look for divinely appointed sources that President Eyring used in his discussion of this concept. Ask students to be prepared to share what they find and to think of how their findings might have helped bring peace to the young man in the scenario. 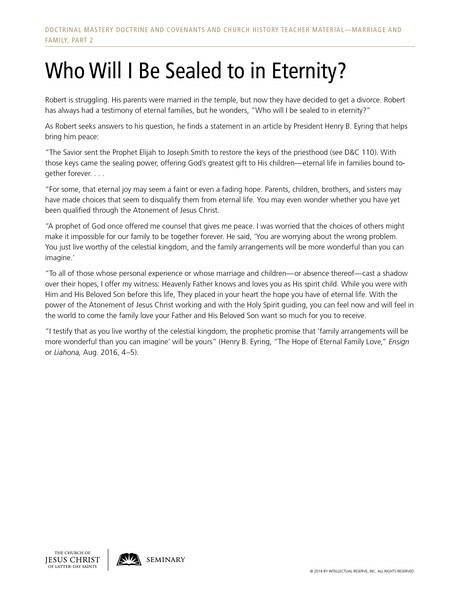 Who Will I Be Sealed to in Eternity? “For some, that eternal joy may seem a faint or even a fading hope. Parents, children, brothers, and sisters may have made choices that seem to disqualify them from eternal life. You may even wonder whether you have yet been qualified through the Atonement of Jesus Christ. “To all of those whose personal experience or whose marriage and children—or absence thereof—cast a shadow over their hopes, I offer my witness: Heavenly Father knows and loves you as His spirit child. While you were with Him and His Beloved Son before this life, They placed in your heart the hope you have of eternal life. With the power of the Atonement of Jesus Christ working and with the Holy Spirit guiding, you can feel now and will feel in the world to come the family love your Father and His Beloved Son want so much for you to receive. “I testify that as you live worthy of the celestial kingdom, the prophetic promise that ‘family arrangements will be more wonderful than you can imagine’ will be yours” (Henry B. Eyring, “The Hope of Eternal Family Love,” Ensign or Liahona, Aug. 2016, 4–5). When students have finished studying, ask volunteers from each group to report on what their group discussed about their assigned principle for acquiring spiritual knowledge. After the activity you might also consider inviting students to discuss other ways that they might invite Robert to use any of the three steps for acquiring spiritual knowledge as he seeks to find answers to his question. Note: The following review activities are not intended to be taught during the same class session as this lesson—“Marriage and Family, Part 2.” Please present these activities during seminary class sessions that take place after you have taught this lesson, but before you teach “Marriage and Family, Part 3.” These short reviews can be taught at the beginning or end of classes in which you teach a regular sequential scripture lesson from the Doctrine and Covenants. Be sure that each of these reviews takes no longer than five minutes, so as not to take away from the scripture block students will be studying in class. What are some things we have learned in seminary about marriage? Ask students to recall which doctrinal mastery scripture passage in the Doctrine and Covenants helps teach the following key statement of doctrine: Only by entering into and faithfully keeping the covenant of celestial marriage can a man and a woman fulfill their divine, eternal potential (D&C 131:1–4). Invite a student to read this passage aloud. Then invite students to suggest ways that they can remember this doctrinal mastery passage and what it teaches. Marriage between a man and a woman is ordained of God, and the family is central to His plan of salvation and to our happiness. Only by entering into and faithfully keeping the covenant of celestial marriage can a man and a woman fulfill their divine, eternal potential. Invite students to read the statements on the board and to find the doctrinal mastery passage in the Doctrine and Covenants that corresponds with each statement (D&C 49:15–17 and D&C 131:1–4). When students have found both scripture passages, invite the class to read them aloud. Then give students the remainder of this review time to silently read and become more familiar with these passages.